Kubb is one of the classic lawn games that combines the best aspects of both horseshoes and bowling. Because of it’s alleged viking heritage, it is recognized by one of its nicknames “Viking Chess”. Kubb involves strategy and skills while throwing wooden blocks at your competitor’s pieces. The point of the game is to knock down all your competitor’s wooden blocks before they knock yours down. To win, you must knock down all the wooden baseline Kubbs and then the King piece. You take turns throwing up to 6 Batons at their 5 wooden blocks while standing 24 feet apart. One of the oldest lawn games, it was created in Sweden more then 100 years ago. They still host a world championship every year in case you are interested. There are a few different sets of rules that differ between countries but main principles remain the same. We cover the US National Kubb Championship Rules and feature some of our official Backyard Games drinking rules at the end. One of the great things about Kubb is that it can be played 1-on-1, 2-on-2, or up to 6-on-6. When playing for fun you can even play with uneven Teams not leaving anyone out. 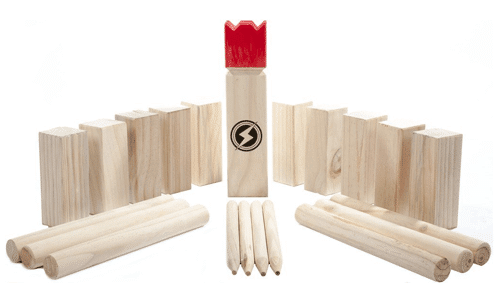 There are 3 different types of wooden pieces in a set that include 10 Kubb, 6 Baton, & 1 King. Start off by measuring out a field, known as a pitch, that is 24 Feet X 15 Feet. You can play this game in all seasons, on grass, sand, gravel and even snow. Use 6 markers to set out all 4 corners and on both sides of the middle line. If you do not have any corner stakes then use shoes, rocks, string, or anything else you can find as markers. Last step is to set up all 5 Kubb pieces on each players baseline putting the kind of the center of the middle line as below. Now your Kubb Field is all setup and ready to play! Once the Kubb field is setup and you have chosen your Team names next is to decide who throws first. Each team can consist of 1 to 6 people per team. Choose a team member from each team to throw a Baton at the King and closets goes first. To make this easier for explaining we will just refer to the two teams as Red & Blue, where Red goes first. You can designate an “Inkastare” on your team. This person is the player that will throw the Kubb back into the opposite teams field, making it a field piece. Another team position is the Driller, the person who might be skilled at throwing the Batons and knocking 2 pieces down together in the same throw. Before you begin throwing those Batons, keep in mind, if any team knocks down the King pin in the middle, it’s an automatic loss. So be careful with your aim! In accordance with the US Championship rules in 2015 the number of Batons you can threw from starting a new game are (2,4,6). This is a bit of the confusing part so please pay close attention to this. The team that gets to throw first (Red) only throw 2 batons this round. The second team (Blue) gets to return play with 4 Batons. After this it is always 6 batons per round and is Reds turn to throw back the Batons. Lets go over the rules in a detailed step-by-step instructions on how to play. The game will begin with the first Team (Red) throwing their batons. From behind their baseline they will try to knock over the Kubb on the other team’s (Blue) baseline. The first team (as mentioned above) will have only 2 Batons to throw. All batons must be thrown underhand and go end-over-end. Sorry folks no spinning circles or infamous helicopter moves. For this example, we are going to say that Red hit both baseline Kubb with their 2 throws. Good job Red! The second team (Blue) now has 4 Batons to throw back. If the Red team had hit any of their Baseline Kubb (2 as we stated above) Blue would throw those same pieces back into the Red’s Field area, the area between the middle line and the baseline. Once landed, Red will then place them standing up. These are now used for protection in the next round. If Blue throws a Kubb outside the Field of play, they can throw it again after all other Kubb have been thrown. If they miss it again for a second time the other team can place it wherever they like if it is one Baton length from the King or any markers. For this example, both throws land successfully in the Field area. Now that The Blue team has thrown their Field Kubb they now have 4 Batons to throw. They will first have to knock over the Field Kubb before throwing at the Red team’s baseline. For this example, the Blue team hit 3 out of 4 of their targets with the batons. This was the Red team’s 2 field Kubb and 1 of their Baseline pieces. Now Blues 2 field Kubb will be returned and added to their baseline. As the Blue Team knocked over one of Reds baseline they will have to throw it into field on the Blue teams side. The Red team is now third to shoot and has 6 Batons to throw. This will be the same as all other rounds going forward. They must first hit the field Kubb before throwing at the Blue teams baseline. Turns out Red team played too many versions of the Kubb outdoor drinking game first and MISSED all 6 shots!! This is a huge advantage for the Blue team now because as Field Kubb’s were still left in the Field Blue will get to throw from the nearest Kubb. The Blue team now has 6 Batons to throw back and get to do it from the closer line of the nearest Field Kubb. The Blue Team was on first and hit all 5 baseline pieces in 5 shots. With their last Baton hit the King knocking him over and win the game! Great job Blue! ? Before you leave us, here’s one more fun fact. There is now an International Day of Kubb on May 5, standing for 5/5. Cute! Haven’t purchased your game yet? Order your game online and I’m sure you can see above how your backyard isn’t going to be the same without a “viking chess” game of Kubb. Game description: This game combines skill and strategy while knocking down your competitor’s pieces. 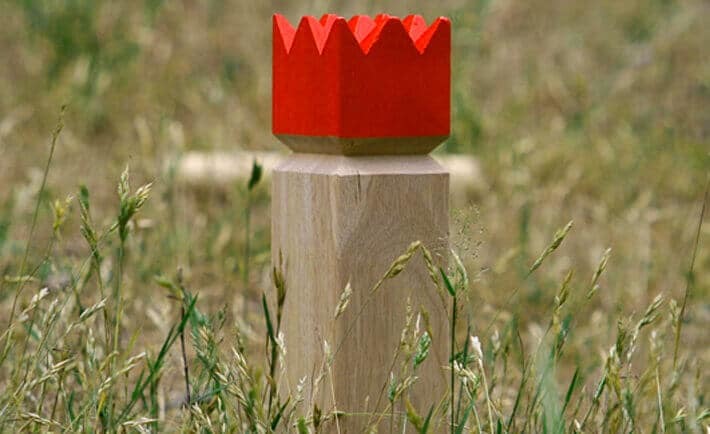 Kubb is one of the oldest outdoor drinking game and was most likely created by Vikings. Nicknamed "Viking Chess"